Hairy Fairies Scratch Card Review - Casino Answers! 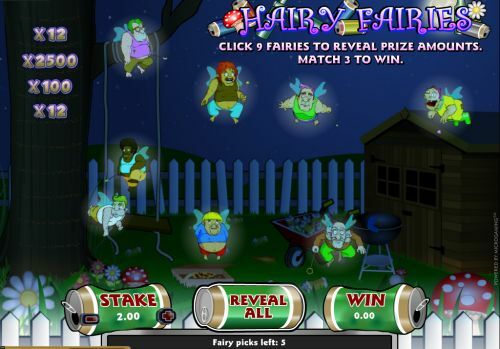 Hairy Fairies is an instant win scratch card game developed by Microgaming. You can play the Hairy Fairies online scratch card at Bovada. The Hairy Fairies casino game is a half-dollar scratch ticket. Bets on the Hairy Fairies lottery ticket are $0.50, $1, $2, $3, $4, $5, $6, $7, $8, $9 and $10 per scratch card game. This is a good betting range for most online scratch card players. To play the Hairy Fairies instant win scratch ticket, select your bet with the “+” and “-” buttons and press the “New Card” button. The 12 fairies will then light up. You will be able to choose 9 of them yourself or press “Reveal All” to automatically select 9 of them. If you can match 3 of the same prize values, you will win that prize. The highest prize value on the Hairy Fairies scratchie game is 2500X your bet. By matching 3 symbols of 2500X in value, you will win the 2500X top jackpot. The second highest prize is 100X your bet. To win these prizes on the Hairy Fairies scratch card, you can play it now at Bovada! There are 6 different prize values on the Hairy Fairies online scratch card. The complete payout schedule is as follows: 2X, 3X, 5X, 12X, 100X and 2500X. You can win up to $25,000 on the Hairy Fairies instant win scratch card! Hairy Fairies is a fun scratch card game that you can play at Microgaming flash casinos. Unfortunately, it is not currently being offered on the Microgaming downloadable casino clients, but you can still play it at the instant play casino at Bovada! Why can’t I find the Hairy Fairies scratch ticket at my Microgaming online casino? Currently, Microgaming casinos are not offering their scratch card games. However, you can still find the Hairy Fairy scratch card and other scratch card games at the no-download instant play casino at Bovada. You can play for free or real money. If you experience any issues with the flash scratch card game, make sure you have the newest edition of Adobe Flash Player installed on your computer. Can USA players play the Hairy Fairies scratch lottery game for real money? No, American players cannot play the Hairy Fairies scratch ticket game for real money at this time. Instead, we recommend that you play Rival-powered scratch cards at Bovada. If you want to read more reviews of other scratch ticket games, please visit our Scratch Cards section for much more!